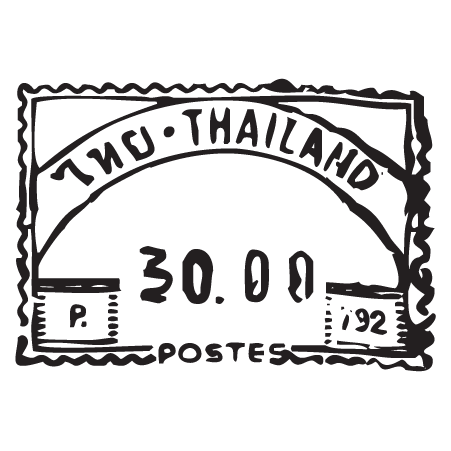 Our Postmark and Postal-themed wall art is designed with aged authenticity in mind. Consequently, the designs are often a bit "rough around the edges" - certainly more so than our other wall art collections. The lines are rarely smooth and the text can at times be difficult to read. This effect adds a sense of aged ephemeral charm to this collection. See it with your wall color! ** = etched is not for walls. Use it on glass, tile, acrylic, & metal. Have a Question or Want to Make a Change? Think you want a different size than what we've offered here? Want to tweak the font style? Add a little somethin' somethin? We can do it. Just let us know what you have in mind with the form below and we will make it happen. Have just a general question about our products? You can still contact us here! What is a stencil decal? A doorway to creativity! A stencil decal allows you to paint any of the designs from our collection (or your own design too) anywhere you'd like. The letters/design are removed from the vinyl substrate background, creating a stencil backdrop you can install on your project surface and paint right over. Easy, no mess, hand-painted and downright lovely. For more information on stencils, visit our Help Page! We know how it is - colors are tricky. It took weeks to pick that perfect paint color and you want your vinyl Wall Quotes™ decal to complement it perfectly. We get it. And we want to help. Order free color samples. Compare. Contrast. See them in different light. And then come back and order with confidence. Our Wall Quotes™ decals are carefully crafted using the industry's highest quality matte finish indoor vinyl film. The adhesive is specifically designed for indoor applications and is easy to remove. It won't peel the paint or damage the walls. These vinyl decals are super flexible and can be applied to many different surfaces - flat walls, textured walls, finished wood, painted concrete, glass, appliances, furniture, tile and more! Indeed, these wall decals are a perfectly quick, easy, affordable way to add a little personality to your walls and your home. Your vinyl wall decals design will come in three layers - an opaque transfer tape, the decal itself, and a thick cardstock-like backing paper. You'll peel away the backing paper, exposing the adhesive backing of the design, press it onto the wall, and peel away the transfer tape. Simple. Each package comes with complete application instructions and an application tool. And, check out our fantastic video library with everything from step-by-step instructions to troubleshooting techniques and insider tips.